Ron Vitale is a fantasy and science fiction author. 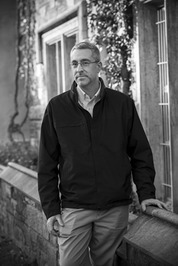 He has a Master’s degree in English Literature from Villanova University where he studied the works of Alice Walker and Margaret Atwood, interpreting their novels with a psychological Jungian approach by showing how the central female protagonists in their novels use storytelling as a means to heal themselves from trauma. He lives in a small town outside of Philadelphia, Pennsylvania. In the fall of 2008, he published his fantasy novel Dorothea’s Song as an audiobook on Podiobooks and for sale in the Amazon.com Kindle store, and in 2011 he published Lost, the first book in the Cinderella’s Secret Witch Diaries series, in 2012 the second book in the series, Stolen, was published and in 2014 Ron Vitale is a fantasy and science fiction author. He has a Master’s degree in English Literature from Villanova University where he studied the works of Alice Walker and Margaret Atwood, interpreting their novels with a psychological Jungian approach by showing how the central female protagonists in their novels use storytelling as a means to heal themselves from trauma. He lives in a small town outside of Philadelphia, Pennsylvania. In the fall of 2008, he published his fantasy novel Dorothea’s Song as an audiobook on Podiobooks and for sale in the Amazon.com Kindle store, and in 2011 he published Lost, the first book in the Cinderella’s Secret Witch Diaries series, in 2012 the second book in the series, Stolen, was published and in 2014 the third book in the series, Found was released. We’d love your help. Let us know what’s wrong with this preview of The Runabout by Kristine Kathryn Rusch. Fantastic look into this classic. The annotations added a whole different layer to the book as I hand't read Frankenstein in decades. Well worth the read! We’d love your help. Let us know what’s wrong with this preview of Pivot by Adam Markel. We’d love your help. Let us know what’s wrong with this preview of Six Figure Author by Chris Fox. We’d love your help. Let us know what’s wrong with this preview of HOW I SOLD 80,000 BOOKS by Alinka Rutkowska. The Speculative Salon's home for discussion of our bi-monthly reads. Hi Ron - Thank you for your friendship!